Last fall I had the amazing opportunity to travel to India to participate in the Science for Monks programme. 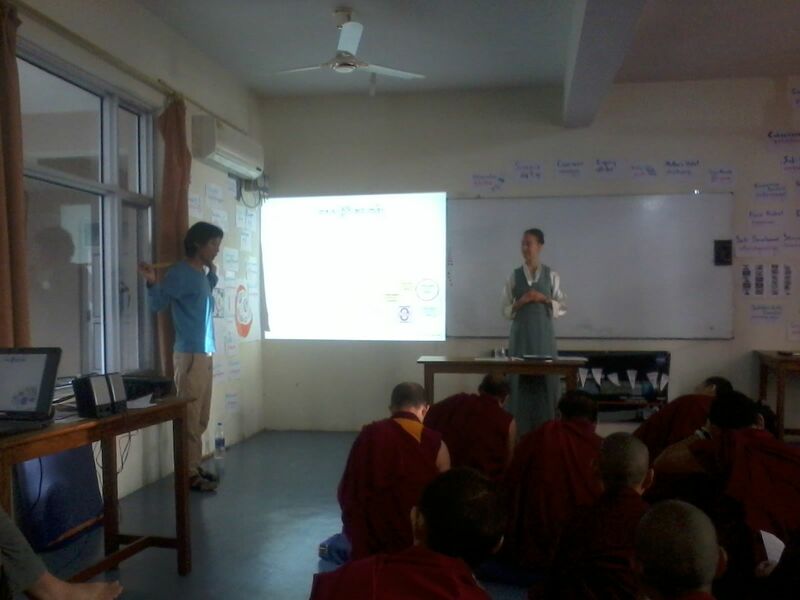 Science for monks is a project that has been established by the Library for Tibetan Works and Archives to teach monastic graduates (mostly geshes) about Western science. They have created this programme at the request of His Holiness the Dalai Lama. 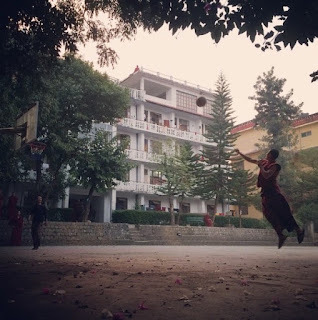 Every year a group of monastic graduates from a wide range of monasteries all over India (this year even including some from Bhutan) travel to study together for a month and learn the basics of physics and neuroscience. The programme is mostly taught by faculty from the Exploratorium, a science museum in San Francisco. However, towards the end of the programme, some scientists currently doing research are invited to share some of their latest findings. This is how I came in. I was requested to come to India to teach about my work on computational models of the mind and meditation. You can imagine I was pretty excited! One morning in October I left for India. I went a few days early so I could travel to Varanasi and enjoy my chance to go to the East a bit more. In some sense, that may not have been an amazing idea, since it was just the holiday of Diwali, meaning that the city was packed. It was a bit of a culture shock, but also quite beautiful to be surrounded by so many devout people making their rounds between the temples. Probably a highlight was an early morning boatride on the Ganges, seeing the sun arise between the burning ghats, the cremation places. It is almost surreal. Now what a difference was the arrival in Dharamsala, where the course was held, with crammed Varanasi! When we flew into Dharamsala, we were welcomed by a team from the organisation and brought to the monastery. The teaching programme took place in Sarah, a monastic study college somewhere to the south of Dharamsala. Every day was divided into four sessions with lectures from each of the lecturers in turn. 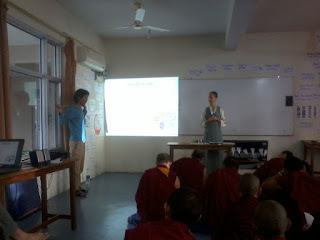 We had all sent our slides beforehand, so they could be translated into Tibetan. Now how often does it happen that you get to present from Tibetan slides, and have a translator by your side who turns every phrase into Tibetan? What made this interesting is that it forced me to be much more precise about what I am saying! In my lectures I talked about creating computer models of the mind, with which we basically simulate what we think the humans are doing in particular cognitive tasks. We test these models by giving them the same tasks as humans and then seeing whether those produce the behavior we see in humans. The idea is that if you can build a system, then you understand it. We talked about computational models of decision making that assume that decisions are driven by a noisy process that meanders over time as information accumulations, and that turns into a response when it crossed a decision threshold. To better understand it we acted out this model: some monks being the decision threshold, some a meandering piece of information. It was great fun! One of the amazing things of teaching these monastics is that they are quick to laugh and extremely engaged. No bored looks here! Things got a bit more intense when I presented my computational model of meditation (or at least the beginnings thereof). While they understood my interest in studying meditation, they were worried that this ignored many important aspects of the practice. I agree, and this led to good discussions about how science consists of making models of reality, that are clearly only approximations. The important thing is not to start believing in them too seriously! Another interesting question they asked me is why I needed all these participants in my experiments. 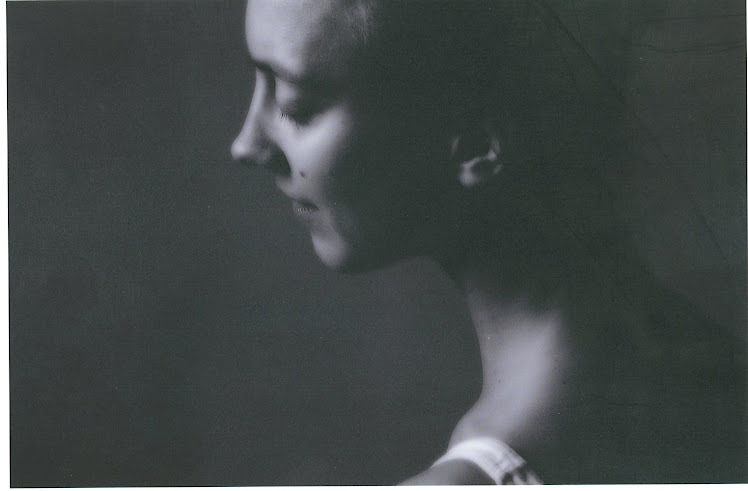 Since I am a meditator myself, why could I not just study myself? This led to some good discussions about the science of measurement and needing larger groups to be able to generalize to the whole population. The monastics had pretty intense days, because apart from our lectures during the day, they did some ritual practices ("puja") in the evenings, as well as debate. Debate is its own story, and quite fascinating to watch. In a very stylized physical game, monks debate important philosophical issues to increase their understanding. Even when you do not speak Tibetan and cannot understand what they are talking about, it is still a fascinating thing to watch! Apart from this being an amazing experience, what did it teach me? 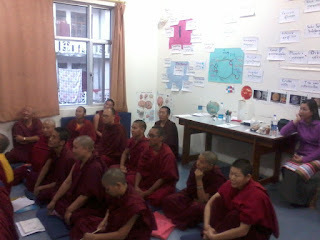 First, it showed me that Tibetan monks do not spend most of their time meditating, but rather, study place a prime role. I think it would be really interesting to do scientific studies on how these study programs help to transform people's minds. Another lesson was that the monastic don't make such a difference between science and ethics as we do in the West. They kept asking me about compassion and about how my work was going to alleviate the suffering of beings. I think it is really good to be reminded of that time and again. Maybe we should do a little more of that. And wouldn't it be awesome if we could introduce some of the debating or analytical meditation methods in our Western university classrooms?